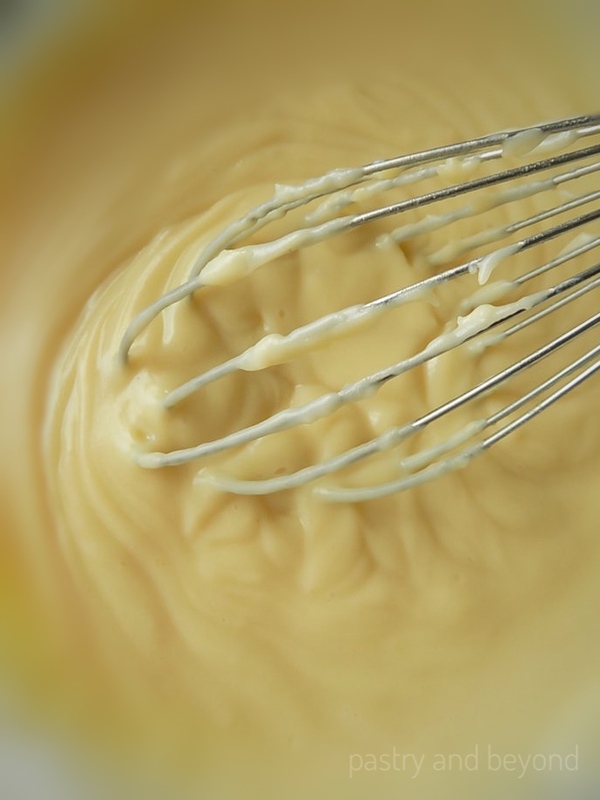 You can easily learn how to make pastry cream. It takes only 10 minutes to make this delicious and smooth cream! If you are careful enough, you can come up with a smooth, delicious pastry cream in 10 minutes. I sometimes make it with flour and sometimes with cornstarch. 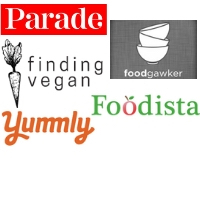 The ingredients I am using are milk, whole eggs, sugar, cornstarch or flour and pure vanilla extract. 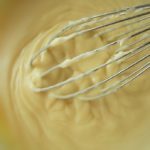 When I use cornstarch instead of flour, this pastry cream becomes gluten-free (If you are gluten sensitive, make sure that you use pure cornstarch. It should write gluten free in the package). I talk about these steps below. First I put the milk and half of the sugar in a saucepan and bring to a boil. While the saucepan is in the stove, I mix sugar and cornstarch/flour very well in a heat proof mixing bowl (I don’t sift the cornstarch/flour so I mix it well). Then I add the egg and mix until the mixture is smooth. There are no lumps in the mixture. When the milk and sugar come to a boil, I immediately remove the saucepan from the heat and temper the eggs. Tempering is a process of bringing two ingredients’ different temperatures slowly into the same temperature. Before I combine the milk and egg, I have to increase egg’s temperature slowly. If I add in egg mixture to the milk mixture without tempering, the eggs will cook. So I have to prevent this happening. What I do is, I pour almost 1/3 of the milk very slowly to the egg mixture. While I am pouring the milk, I whisk the mixture constantly to prevent it curdling. Now the eggs’ temperature is raised so I can pour the tempered eggs into the milk. Finally, I pour the pastry cream into a heat proof bowl and cover the surface with a plastic film to prevent a skin forming on top. When it cools down, I put it in the refrigerator. Put the milk and half of the sugar in a saucepan and bring to a boil at med-high heat. While the saucepan is on the stove, mix half of sugar and cornstarch/flour very well in a heat proof mixing bowl and then add the eggs and mix until the mixture is smooth. There should be no lumps in the mixture. 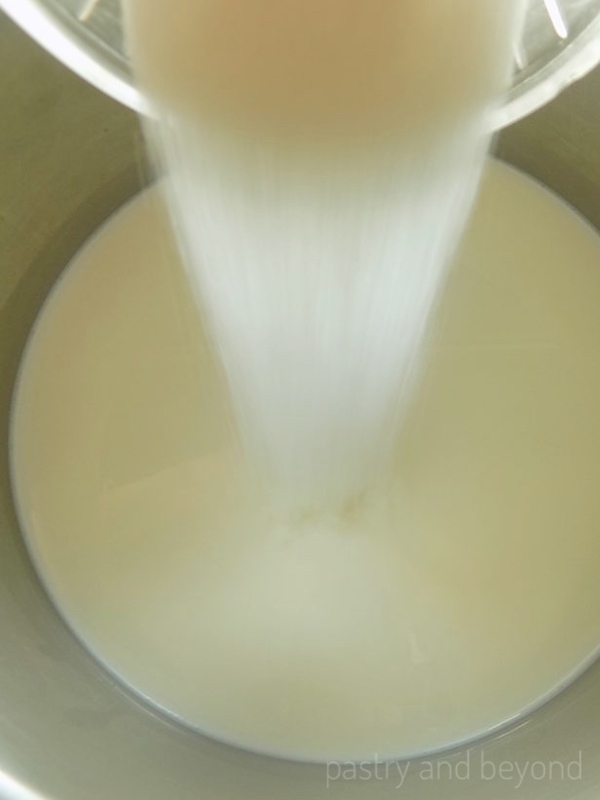 When the milk and sugar bring to a boil, immediately remove the saucepan from the heat and temper the eggs: pour almost 1/3 of the milk very slowly to the egg mixture, whisking constantly at the same time to prevent it curdling. Pour the tempered eggs into the milk mixture and whisk at the same time. Add in the vanilla and whisk. Place the saucepan over med-high heat and let the mixture boil for 2 minutes until it is thick and smooth. Take the pan from the heat and pour the pastry cream into a heat proof bowl. 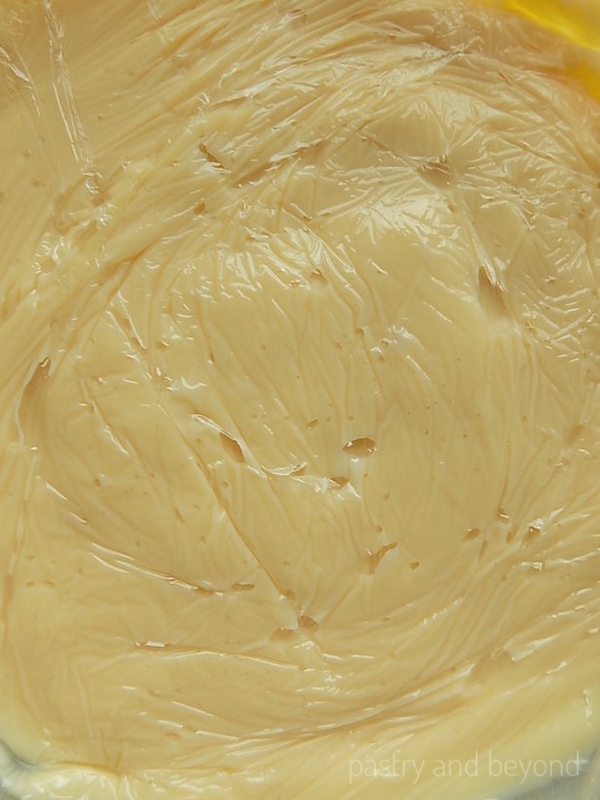 Cover the pastry cream with a plastic film, lightly press so plastic film can touch the pastry cream when covered and prevent a skin forming on top. Thank you Meymi! I tried and the result was great..